It may sound self-serving, but it is truly essential that every Marcellus shale Landowner retain an experienced Oil and Gas Lawyer to represent their interest in negotiating and reviewing any offered Oil and Gas Lease, Pipeline Right-of-Way Agreement, Roadway Agreement, Surface Use Agreement, or any other contract related to natural gas development. Signing an Oil and Gas Lease, Pipeline Right-of-Way Agreement, or other contract with an energy company can be a life-changing event that involves the Landowner’s primary and most valuable asset – their land. Executed Oil and Gas Leases and Pipeline Right-of-Way Agreements often remain in place for the remainder of the Landowner’s lifetime and into future generations. Any decision this important must be made with the assistance of experienced and qualified Oil and Gas Attorney. The Landowner should question their potential lawyer directly on how many Oil and Gas Leases, Pipeline Right-of-Way Agreements, or other natural gas contracts they have negotiated. 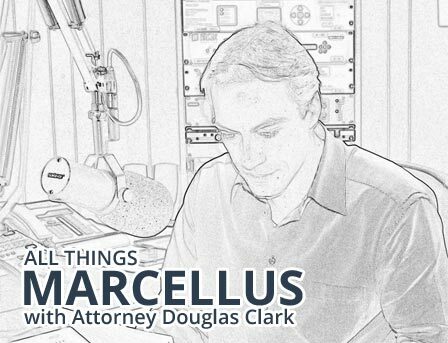 The important decision of leasing your Marcellus Shale, Utica Shale or other natural rights is far too important to trust to inexperienced legal counsel. Oil and gas law is a complex field difficult to navigate for a novice lawyer. Mistakes can cost Landowners thousands or possibly millions of dollars and leave your property open to unwanted industrial activity. Even if a Landowner feels content with a company offered Agreement, these contracts must be carefully reviewed with an experienced oil and gas lawyer before execution. Mistakes can be permanent. Remember, the energy companies have highly paid and skilled experienced lawyers working for their interests. The Landowner must arm themselves with a skilled and experienced attorney to fight for their rights and level the playing field. The Clark Law Firm, PC represents only Landowners and has negotiated hundreds upon hundreds of Oil and Gas Leases, Pipeline Right-of-Way Agreements, Roadway Agreements, Surface Use Agreements, and many other natural gas contracts. Our office also offers detailed reviews of company presented Agreement and advises Landowners of the strengths, and most importantly, the weaknesses of any gas or pipeline company offered contract. Whether you contact The Clark Law Firm, PC, or other oil and gas counsel, do not go through this important process without experienced legal counsel you can trust. Perhaps this should be listed as the “Number 1 Biggest Mistake”. Landowners must never forget that the Landman works for the gas or pipeline company and NOT the Landowner. (Please bear with me as I need to be a broken record on this point). If you have any question about this fact, simply ask the Landman who they work for and ask them to show you their business card. You will not find your name on their business card. Landman typically are employed by the gas or pipeline company directly or work for a land service company hired as independent contractors by the gas or pipeline company. Sometimes the Landman will be an “independent” Landman who also works as an independent contractor for the gas or pipeline company. However, in no circumstances does the Landman work for you. responsibility to understand this relationship and not allow themselves to be taken advantage of during any negotiation process. Landowners should educate themselves about this process and obtain their own experienced and skilled legal counsel to protect their rights and property. Landowners should never sign an Oil and Gas Lease, Pipeline Agreement or any other company offered contract without understanding and exploring what additional financial compensation and property protection terms may be available through additional negotiation. Far too many Landowners have signed and continue to sign company offered boilerplate Agreements without maximizing the benefits available through negotiation. A skilled negotiation may produce thousands or even millions of dollars in increased financial compensation. Likewise, a wise negotiator will have an eye on the potential future physical impact that natural gas operations may have on the Landowner’s property. Every natural gas and pipeline Agreement must be negotiated to maximize Landowner compensation but ALSO protect the property today and for future generations. If the Landowner is going to sign an Oil and Gas Lease or Pipeline Agreement that will affect their land decades, they must not only know what property protections are in their Agreement, but know what protections may be available, but lacking. Remember, Landowners rarely get a second opportunity to negotiate an Agreement with a gas or pipeline company. Landowners often fall into the Landman trap of focusing solely on the up-front bonus payment, future royalty percentage, and the promise of future riches. Make no mistake, the bonus payment and royalty calculation terms are critical and must be maximized. However, there are equally crucial terms that Landowners must consider that are often inconspicuously woven into the language of a complex Oil and Gas Lease. These subtle and often misunderstood terms that may negatively impact the Landowner for decades into the future. The gas and pipeline company landmen will typically direct the Landowners attention to the compensation aspects of the Agreements and the potential for future riches and quickly gloss over the substance of these complicated documents. Energy companies capitalize on uninformed Landowners by presenting Gas Leases and Pipeline Agreements heavily slanted in the company’s favor. Remember, gas and pipeline companies have been negotiating leases and gas development contracts across the country for over a century. They strategically use all of this vast experience to obtain the most friendly gas and pipeline agreements possible. Landowners must recognize these fact and seek the guidance of an experienced oil and gas lawyer familiar with these tactics and equipped to fight for the strongest Landowner Agreement possible. Gas and pipeline companies are often willing to make substantial concessions to the original boilerplate offer presented to the Landowner. These concessions are usually memorialized in the form of written “Addendum” terms added and attached to the basic company Gas Lease, Pipeline Agreement or other Agreement presented to the Landowner. Strong Addendum terms contain critical additions to the company’s boilerplate offer that will protect the Landowner’s property into the future and may also result in significant additional compensation. Whether the concerns involve water contamination, environmental concerns, fields and forest preservation, or to address any other unique property characteristic or Landowner’s concern, a skilled oil and gas lawyer can often negotiate additional protections for the property owner to address their concerns. Carefully negotiated Addendum terms will minimize, or possibly eliminate, the physical impact of potential operations on a property as well as maximize compensation and damage payments to the Landowners. Landowners often focus solely on the royalty percentage figure in the offered Oil and Gas Lease and fail to recognize or consider the impact that post-production costs and royalty “deductions” will have on their future royalty payments. Post-production costs for such items as gathering, transportation, compression, dehydration, marketing, and other items may be deducted from Landowner’s royalty payments under the terms of the majority of gas leases in Pennsylvania. Often Landowners are surprised to see substantial “deductions” in their royalty checks for post-production costs incurred by the gas company after the gas has been extracted from the ground. In some cases gas companies will not agree to enter into Gas Leases that prohibit the deduction of post-production costs. However, in some cases gas companies are willing to negotiate the method of royalty calculation and whether post-production costs deductions are permissible in whole or in part. Post-production costs and deduction language is highly complex and often very misleading. Landowners considering a gas lease must fully understand their royalty calculation provisions and whether they should expect the deduction of post-production costs from their royalty statements. It is imperative that the Landowner understand the method of royalty calculation as a misunderstanding could potentially result in the Landowner receiving thousands, hundreds of thousands or possibly even millions of dollars less in royalties than anticipated. An experienced oil and gas attorney will fight to negotiate the best royalty percentage AND royalty calculation method in your gas lease. Your attorney should also advise you and explain what the complex royalty calculation language in your gas lease really means and what to expect should you receive royalties in the future. All Landowners presented with an Oil and Gas Lease, Pipeline Right-of-Way Agreement, Roadway Agreement, Surface Use Agreement or other natural gas Agreement should educate themselves on natural gas development and what they are facing. However the Landowner must scrutinize the sources of their information. Unfortunately with the rush of gas leasing and pipeline activity comes a plethora of misinformation. Often misinformation is spread innocently, but at times it is spread with malice. Landowners must learn from the past experiences and mistakes of others, but understand that the gas lease and pipeline Agreement markets are constantly changing. In some cases, gas leasing offers are going down but rising in other areas. Also, pipeline Agreements are trending towards higher compensation. However, what may have been highly relevant information or solid advice two years ago, or even last month, may now be stale and irrelevant to your particular situation. Simply going on-line and researching gas lease bonus payments, royalty percentage offers, and Addendum terms without understanding your specific leverage and the ever changing market can lead to poor or even disastrous decisions. An experienced oil and gas attorney understands the changing landscape of natural gas development and will evaluate your specific situation and identify your leverage in your particular negotiation. An experienced oil and gas attorney will incorporate historical negotiation experiences involving the gas or pipeline company you are negotiating with while also considering how other companies have negotiated similar matters in order to maximize your current offer. Most importantly, all evaluations must be viewed in the light of the current and constantly changing leasing, pipeline, and other markets. It is an enormous mistake to simply rely on internet message boards, neighbors, or friends when attempting to understand your leverage or negotiating an Agreement with a gas or pipeline company. No two negotiations are the same and much of the information available on the internet may be stale and irrelevant to your situation. It has never been more important for all Landowners to obtain skilled and experienced legal counsel to represent their interests and guide them at a time when Pennsylvania natural gas development is expanding rapidly and leasing and pipeline markets change quickly. rights or agreeing to a pipeline right-of-way easement. Property owners sometimes report feeling uncomfortable or even intimidated by the actions of aggressive Landman seeking to secure their signatures on important documents. Although, I have found that most landmen are courteous and respectful, there are a wide variety of landmen and tactics they employ in effort to secure Oil and Gas Leases, Pipeline Right-of-Way Agreements or other contracts. No Landowner should ever sign an Oil and Gas Lease or Pipeline Agreement, or any other contract, out of fear, intimidation or pressure. These Agreements are too important and may impact your property for generations. Never let yourself be bullied or pressured into signing a natural gas contract. An experienced oil and gas attorney will protect their client’s interests and eliminate stress and confusion from the negotiation process. If you are feeling bullied or pressured by a Landman, contact us today. mean person to request for you to sign a company friendly agreement. Although sometimes a Landman may get aggressive and even nasty, generally treating people poorly does not result in Landowners signing the requested documents. the best Agreement possible. Landmen will often tell the Landowner what the Landowner wants to hear during discussions at the kitchen table and even promise to work obtain better Addendum terms for the Landowner. The Landman may even make assurance that they can get the company to agree to additional Addendum terms requested by the Landowner but then act surprised when they are unable to fulfil these promises. The Landowner may then feel that the Landman was really trying to help the Landowner and if the Landman could not get these concessions from the company, then these concessions must be unavailable. I have seen this scenario, or trick of the trade, play out many times and it appears as a common Landman tactic to win the confidence of Landowners. Always remember that the Landman works for the company and not the Landowner. In almost all cases, once an oil and gas lease or any other Agreement is signed, the Landman immediately moves on to the next Landowner in effort to lease the next parcel or secure the next pipeline or other Agreement. An Oil and Gas Lease and Pipeline Right-of-Way Easement Agreement will usually impact a Landowner’s valuable property for many years into the future, well after the Landman has moved on to the next parcel or project. The Landowner must retain an experienced Oil and Gas Attorney they can trust to represent their interests, not the company’s interests. Landowners often resist retaining an Oil and Gas Lawyer in an effort to avoid perceived costly legal fees. This is an unfortunate misconception and a mistake. Oil and Gas Leases and Pipeline Right-of-Way Agreements typically impact your property for generations into the future. If the Oil and Gas Lease or Pipeline Right-of-Way Agreement is excessively friendly to the energy company, these company slanted terms will apply through the life of the Agreement to the detriment of the Landowner. Time has shown that gas and pipeline companies will maximize the benefits they have obtained in their company friendly Agreements with Landowners. Landowners must obtain the best possible Agreement at all times. We are landowners in Bradford County. We have leased land to one of the major gas companies and have been approached by them several times for various reasons relating to the infrastructure necessary for the gas drilling process. Good legal representation is essential for landowners because there is so much information to absorb and understand relating to the Marcellus Shale and it can be truly overwhelming. We have negotiated a Compressor Station, Water Impoundment Pond, Gas Pipelines, Well Pad and Access Roads. When we were initially approached, my husband did research on the internet and found the name of Clark Law Offices in Peckville, PA and was very impressed. We have been so very fortunate to have used their law firm. Doug is fair, diligent, and well versed on all of the many complicated issues that relate to the Marcellus Shale. He is a strong negotiator and we were extremely pleased and pleasantly surprised with the amount of the potential financial awards and the subsequent sign-up fees that he was able to negotiate on our behalf. Phone calls and emails are answered promptly and his office staff is polite and very knowledgeable about ongoing cases. Additionally, Doug Clark’s Law Firm is well respected by the gas companies. Using his firm has been a win-win situation and we consider ourselves very lucky to have found them.